The MyGSM 2I2O GSM module puts you at the controls with two outputs and two inputs – what you do with them is entirely up to you! 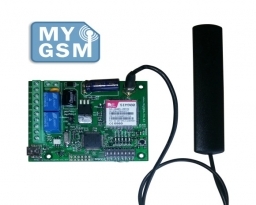 With the MyGSM 2I2O your phone becomes a long-distance remote control and a magic wand all rolled into one – connect the outputs up to your electric gate at home and you can open it fully and for pedestrians from anywhere in the world via a free missed call, SMS or Please Call Me. Or use one output to start your pool pump and the other one to switch on your mini fridge so that those brewskies are nice and cold by the time the rugby starts. No airtime for a missed call? No problem! The MyGSM range can even be configured to react to a Please Call Me – now that’s total control and total freedom! You’ll never be stuck outside your house again. The MyGSM 2I2O also offers two inputs that can be used to monitor practically any electrical device you can think of. If it exists and runs on electricity, MyGSM will keep an eye on it for you. Here’s a neat trick: press the call button on your phone and watch the world transform into a fully automated future-scape over which you have total control. If you have the MyGSM 2I2O installed, that is! Dual outputs allow you to control two different electrical devices, and you’ll receive SMS notifications right to your phone whenever either or both of the twin inputs are triggered. You have total freedom when it comes to how you set your module up. The MyGSM 2I2O can be configured via an SMS command, from the incredibly user-friendly and secure web portal or even using your PC or laptop’s USB port. Using any or all of these methods, you can add, edit and delete users, edit output settings and much more! Want to know how strong the network signal is in the area? With the MyGSM 2I2O, all you have to do is ask! Pressing the onboard test button will display the current signal strength of the module via a series of clearly visible LEDs, so there’s no need to waste an SMS to query it. Peace of mind is part of the package with the MyGSM 2I2O GSM unit. Only the master administrator has the power to learn in numbers or change settings, so you know that your security is never compromised. Thanks to the inputs having both rising and falling edge capabilities, a single input can notify you when your power goes off AND when it comes back on! There’s no wasting inputs with the MyGSM 2I2O! The MyGSM.co.za web portal offers you easy and unparalleled set up and administration of your MyGSM devices. It also provides for a bulk SMS messaging platform, allowing you to send SMS messages to your contacts.